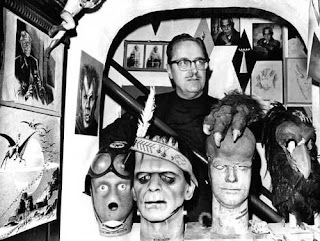 Brett Weiss: Words of Wonder: Forrest J Ackerman R.I.P. LOS ANGELES -Forrest J Ackerman, the sometime actor, literary agent, magazine editor and full-time bon vivant who discovered author Ray Bradbury and was widely credited with coining the term "sci-fi," has died. He was 92. Ackerman died Thursday of heart failure at his Los Angeles home, said Kevin Burns, head of Prometheus Entertainment and a trustee of Ackerman's estate. Although only marginally known to readers of mainstream literature, Ackerman was legendary in science-fiction circles as the founding editor of the pulp magazine Famous Monsters of Filmland. He was also the owner of a huge private collection of science-fiction movie and literary memorabilia that for years filled every nook and cranny of a hillside mansion overlooking Los Angeles. "He became the Pied Piper, the spiritual leader, of everything science fiction, fantasy and horror," Burns said Friday. Every Saturday morning that he was home, Ackerman would open up the house to anyone who wanted to view his treasures. He sold some pieces and gave others away when he moved to a smaller house in 2002, but he continued to let people visit him every Saturday for as long as his health permitted. “My wife used to say, 'How can you let strangers into our home?' But what's the point of having a collection like this if you can't let people enjoy it?" an exuberant Ackerman told The Associated Press as he conducted a spirited tour of the mansion on his 85th birthday. His collection once included more than 50,000 books, thousands of science-fiction magazines and such items as Bela Lugosi's cape from the 1931film "Dracula." His greatest achievement, however, was likely discovering Bradbury, author of the literary classics "Fahrenheit 451" and "The Martian Chronicles." Ackerman had placed a flyer in a Los Angeles bookstore for a science-fiction club he was founding and a teenage Bradbury showed up. Later, Ackerman gave Bradbury the money to start his own science-fiction magazine, Futuria Fantasia, and paid the author's way to New York for an authors meeting that Bradbury said helped launch his career. "I hadn't published yet, and I met a lot of these people who encouraged me and helped me get my career started, and that was all because of Forry Ackerman," the author told the AP in 2005. Later, as a literary agent, Ackerman represented Bradbury, Isaac Asimov and numerous other science-fiction writers. He said the term "sci-fi" came to him in 1954 when he was listening to a car radio and heard an announcer mention the word "hi-fi." "My dear wife said, 'Forget it, Forry, it will never catch on,'" he recalled. Soon he was using it in Famous Monsters of Filmland, the magazine he helped found in 1958 and edited for 25 years. Ackerman himself appeared in numerous films over the years, usually in bit parts. His credits include "Queen of Blood," "Dracula vs. Frankenstein," "Amazon Women on the Moon," "Vampirella, " "Transylvania Twist," "The Howling" and the Michael Jackson "Thriller" video. More recently, he appeared in 2007's "The Dead Undead" and 2006's "The Boneyard Collection." Ackerman returned briefly to Famous Monsters of Filmland in the 1990s, but he quickly fell out with the publisher over creative differences. He sued and was awarded a judgment of more than $375,000. Forrest James Ackerman was born in Los Angeles on Nov. 24, 1916. He fell in love with science-fiction, he once said, when he was 9 years old and saw a magazine called Amazing Stories. He would hold onto that publication for the rest of his life. Ackerman, who had no children, was preceded in death by his wife, Wendayne. 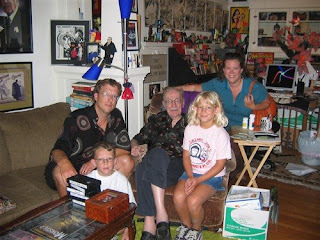 My family and I were lucky enough to meet "Uncle Forry" (as his most devoted fans called him) on a couple of different occasions, once at Comic-Con in San Diego, and once at his home in Hollywood (circa 2006). 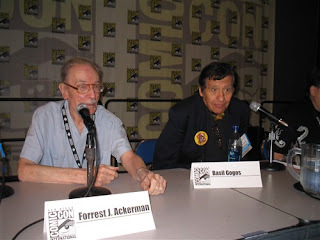 Forry on a discussion panel with Famous Monsters cover artist Basil Gogos. Forry entertaining guests in his Hollywood bungalo (a significantly smaller home than his previous residence), which some referred to as "Son of Ackermansion." Forry back in the day.